KEEP CALM AND CARRY ON: Wizarding World Of Harry Potter! One thing you might not know about me: true Harry Potter fan since the very beginning. No shame here. I remember the time I read the first book. My dad had actually bought it for me before our trip to Hawaii because he insisted I needed something to read for the long flight. Being the bratty teenager that I was at the time, I'm sure I rolled my eyes and gave him a dirty look like, "I won't be needing that." Wrong. 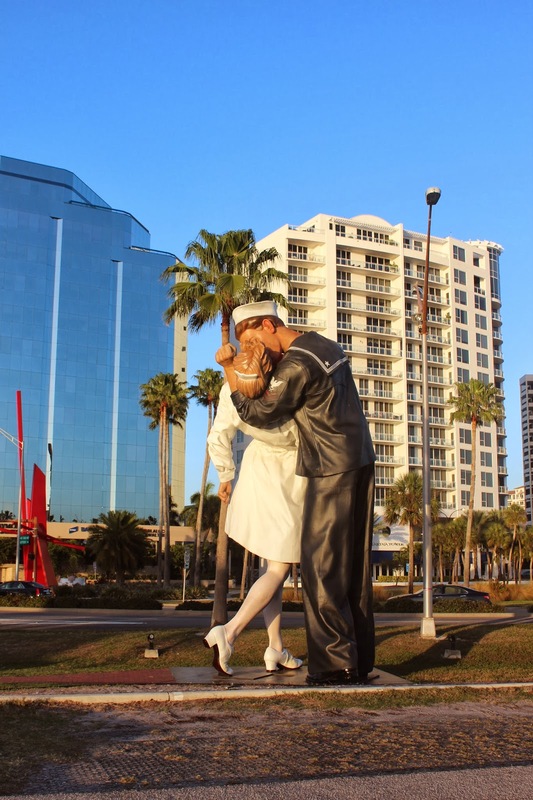 Moving on-we both knew being in Sarasota was the perfect time to make the drive to Orlando to go see the Wizarding World Of Harry Potter at Universal. We were SO excited to go and made sure we got there right after the doors opened at 9am! We had a beautiful day for it too...upper 70's/low 80's (can't remember exactly), but it couldn't have been better. 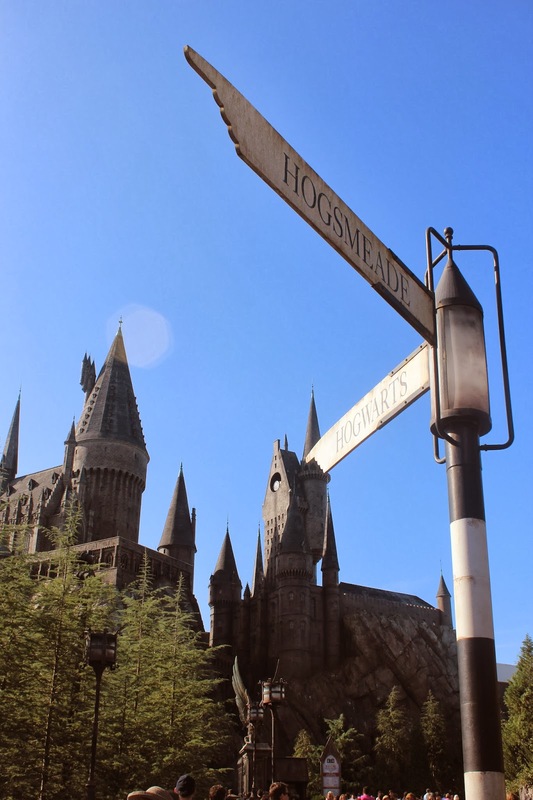 The Wizarding World of Harry Potter is a themed area spanning two theme parks in the Universal's Islands of Adventure. 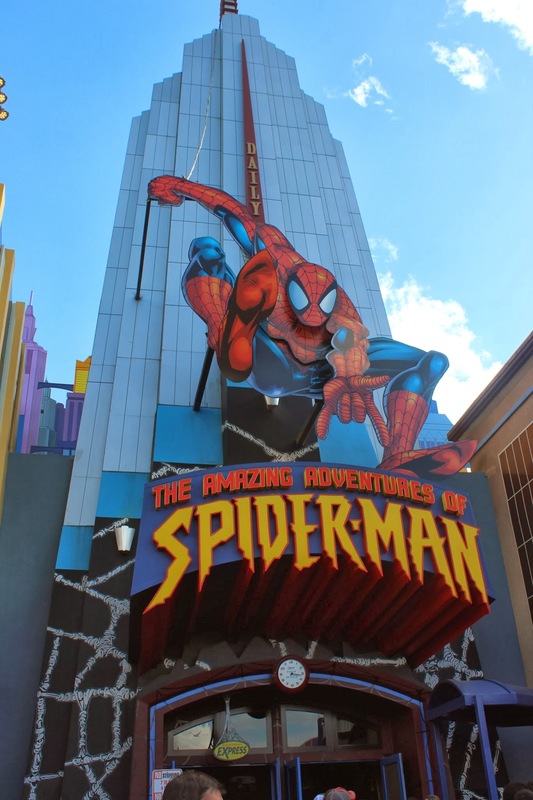 Other areas inside Islands of Adventure include: Jurassic Park, Spiderman, Incredible Hulk, Toon Lagoon and Suess Landing (both great if you have kids), Poseidon's Fury (not worth going to), and more. Looks pretty cool, doesn't it? We got really lucky because we were able to pretty much walk right on the main ride: Harry Potter and the Forbidden Journey. 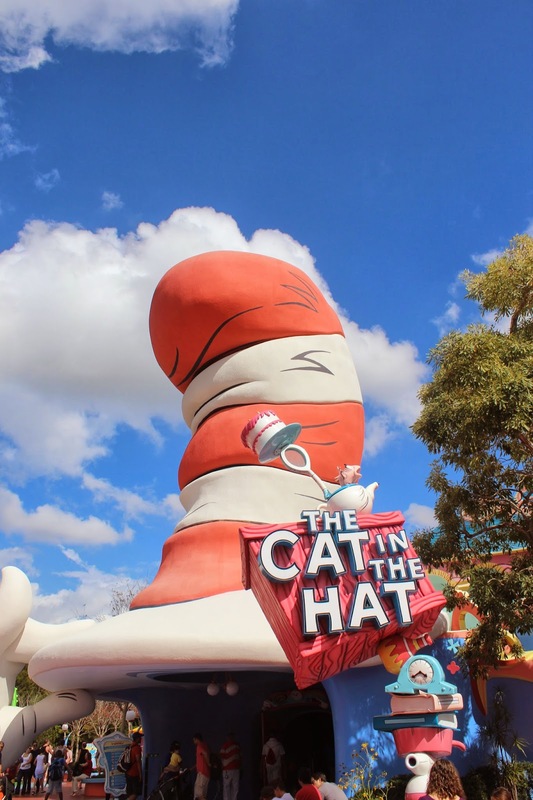 *tip: If you are visiting, make this ride the first place you go to avoid the lines and crowd! This is what Universal's website says about the ride: "Enter through the towering castle gates and make your way down the familiar passageways and corridors of Hogwarts™ School of Witchcraft and Wizardry. You'll visit iconic locations such as Dumbledore's office, the Defence Against the Dark Arts classroom, the Gryffindor™ common room, the Room of Requirement and more. Then get ready to soar above the castle grounds as you join Harry Potter™ and his friends on an unforgettably thrilling adventure, coming face-to-face with an array of magical creatures! 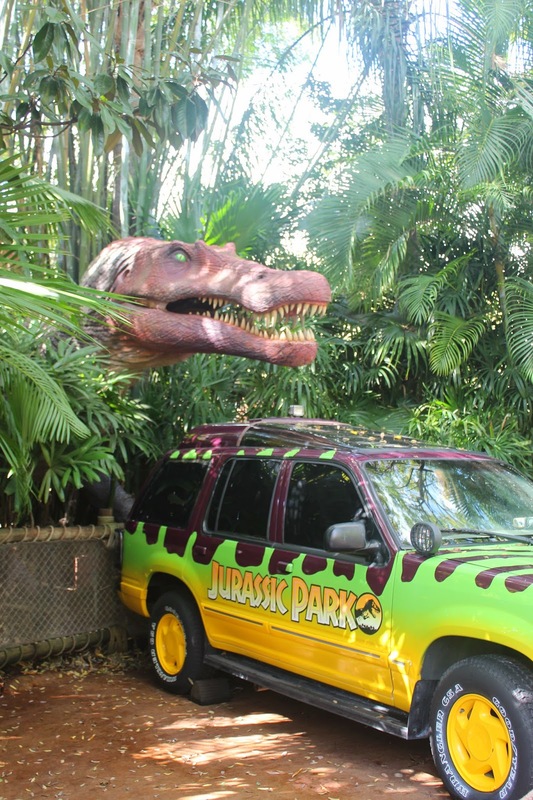 This amazing attraction uses groundbreaking, state-of-the-art technology (and a little magic) to create a one-of-a-kind ride experience." 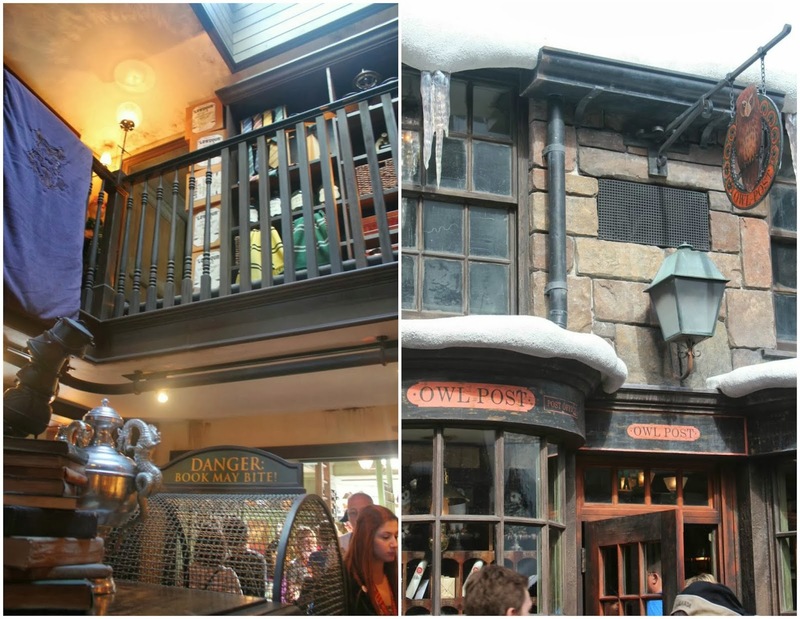 If you're a Harry Potter fan, you've probably heard about the famous Butterbeer! 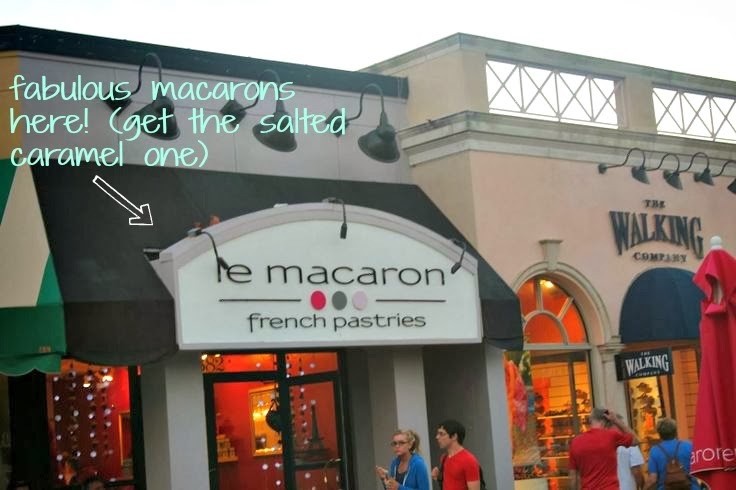 Oh man, this stuff is SO delicious...you have to get it if you go! It's a mix of shortbread cookies and butterscotch, and it's not real beer like many think it is. We had multiple glasses of Butterbeer, but I would say the best is the frozen kind. Yum. We decided to have lunch in Hogsmeade (ha) at the Three Broomsticks, which has authentic British food in a rustic tavern type setting. LOVED it here! They even had their own Hogs brew that was surprisingly really good. Beer, corn on the cob, chicken (for Billy), and roasted potatoes...can you go wrong? I don't want to spoil too much about this area since I'm sure some of you plan on visiting, but they had a really cool wizard and wand show that I highly recommend checking out. It was our favorite part to see! And of course, they had shops you could go in but I didn't really find anything worth bringing home. We really, really enjoyed our day here! I will say this...if you think you will spend all day in the Wizarding World of Harry Potter, that's not the case. You could spend a couple hours max, but that's it. Afterwards, we explored all the other parts of the Islands of Adventures and called it a day around 5pm. I think it's worth spending the money on and seeing if you really like Harry Potter. They are actually expanding the area more this summer, so there will be even more to see then as well. We did say that we wished they had more shows/presentations you could see, but I'm thinking they might add some in the future. Overall, it was one of the most fun days we've had in months. Just make sure you go early if you plan to go! Residents of Florida...I'm jealous of you. Come summer it will be a different story, but yep definitely jealous right now. Missing it already. 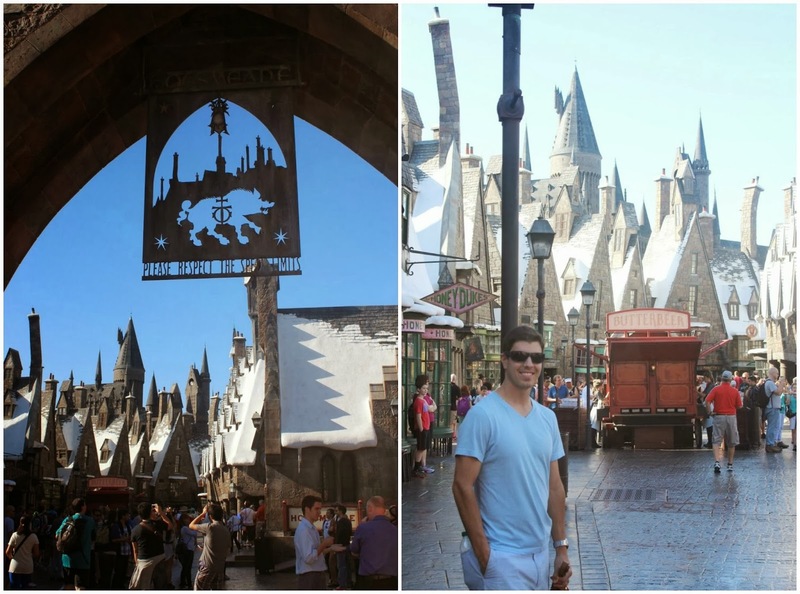 Have you been to the Wizarding World Of Harry Potter? What were your opinions on it?! If you want more information about it, I found this site really helpful. Looks fun! We're going to Disney World and Universal in March. I can't wait! I work at one of the onsite hotels for Universal and love reading reviews like this. You came at the perfect time too. We are all slightly afraid for the new Harry Potter opening - when it opened 4 years ago it was a 9 hour wait just to get into the park!! Glad to hear you had fun! It's my dream to go there! My brother and I want to go so badly and the rest of my family just wants to go to watch us because every time we talk about it we get so excited. I LOVED the Harry Potter part of the park! It was so fun for this HP nut! EEEEE im so happy you loved it!!!! i love Universal!! :D cant wait to go back when they expand to gringotts bank! We loved the Harry Potter experience! My husband is not as big of a harry potter lover as me though; so when the longest line I made him wait for in was for butterbeer, he was so bummed to discover it wasn't actually alcohol. They were selling real beer though, so we both walked away happy. OMG I'm so jealous of your trip to the WWoHP!! Like you, I've read and watched all the movies countless times and love them so much! Thanks for posting all the wonderful pics. 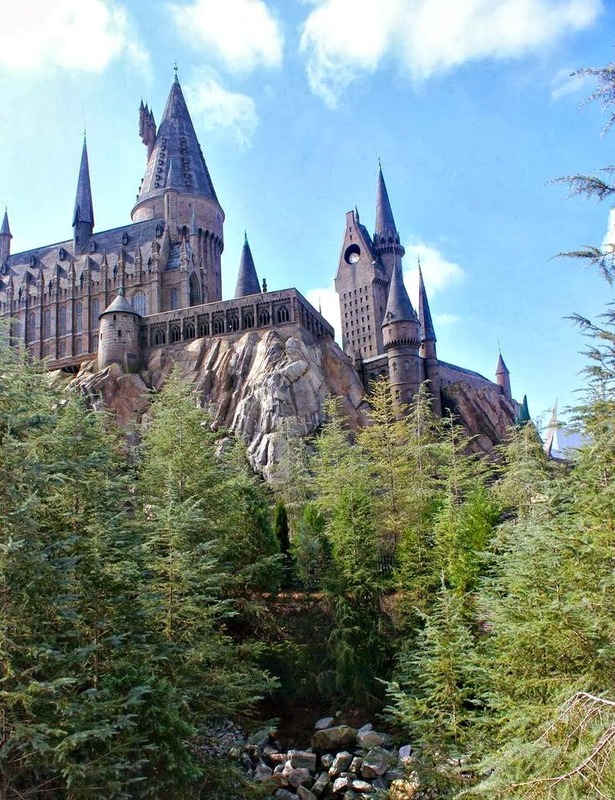 Someday, hopefully sooner rather than later, my husband (also a HP convert like Billy) and I can make the trip down and check it out for ourselves! I loved it! Even better is that they are expanding it!! I loved the frozen butter beer and the ride wasn't actually what I anticipated but it was really neat though. Oh my gosh! I have been wanting to go there for so long and now I really want to go there! I love Harry! I am a HUGE Harry fan and hope to go in November with my sister and SIL:) Great pictures! Ahh, I've been trying to convince my husband that we should take a trip to Florida JUST so I can go to Harry Potter world... don't think he's convinced just yet haha looks like a great trip! PLEASE TAKE YOUR TIME AND READ THIS GREAT TESTIMONY. BE CAREFUL HERE, NOBODY CAN HELP YOU HERE OR EVEN SUGGEST HOW YOU CAN GET YOUR EX OR LOVE BACK,ANY TESTIMONIES OF MOST SPELL CASTER HERE MUST BE IGNORED.BECAUSE MOST OF THEM ARE SCAM I MEAN REAL SCAM WHICH I WAS A VICTIM AND I GOT RIPPED OF THOUSANDS OF DOLLARS BECAUSE I WAS SO ANXIOUS TO GET MY WIFE KATARINA BACK AFTER SHE LEFT ME FOR OVER 2YEARS WITH MY 3YEARS OLD SON JERRY,I HAVE APPLIED TO 7 DIFFERENT SPELL CASTER HERE I MET ON THIS BLOG AND ALL TO NO AVAIL THEY ALL ASK FOR SAME THING SEND YOUR NAME YOUR EX NAME ADDRESS AND PICTURE PHONE NUMBER ETC WHICH I DID OVER AND OVER AGAIN AND MOST OF THEM WERE FROM SOUTH AFRICA, I WAS SO CONFUSED AND I WAS ALWAYS SICK BECAUSE OF THIS PROBLEM AND I WAS SO DESPERATE TO HAVE KATARINA BACK TO ME I LOVE HER SO MUCH AND COULD DIE FOR HER. I SAW THIS Email Online ABOUT DR USMAN KERIM THE GREATEST SPELL TEMPLE, (dr_usman.spiritualist@outlook.com) TEMPLE OF BLACK AND WHITE IN NIGERIA, AND I DECIDED TO MAIL HIM.HE TOLD ME THAT ALL MY PROBLEM ARE OVER SINCE I HAVE DECIDED TO CONTACT HIM FOR HELP, HE TOLD ME TO EXPLAIN WHAT HAPPENED BETWEEN ME AND MY EX WIFE KATARINA AND I DID, I TOLD HIM ALL THAT HAPPENED FROM THE BEGINNING. AND HE SAID TO ME MY CHILD WHAT YOU JUST EXPLAINED TO ME NOW IS A LITTLE PROBLEM TO HANDLE COMPARE TO SERIOUS PROBLEMS I HAVE HANDLED, I WAS SO SHOCKED AND I SAID TO MY SELF WHAT PROBLEM COULD BE MORE SERIOUS THAN THIS. HE TOLD ME WHAT I NEEDED TO DO AS SOON AS POSSIBLE, BUT WHAT HE SAID LOOK SIMILAR TO WHAT I HAVE HEARD IN THE PAST, I WAS HAVING DOUBT ABOUT IT BECAUSE OF PAST EXPERIENCE, BUT I DECIDED TO TRY SINCE HE IS FROM NIGERIA HE COULD BE REAL AND DIFFERENT. SO I GAVE HIM 50% OF MY TRUST. THIS WAS LIKE I MAGIC AND DREAM COME TRUE TO ME, AFTER TWO DAYS WHEN THE SPELL HAS BEEN CASTEED, KATARINA FLASHED ME AT ABOUT 9.PM I COULD NOT SLEEP THAT NIGHT BECAUSE I REALLY LOVE KATARINA AND WANT HER BACK. BY 7.AM THE NEXT MORNING SHE GAVE ME ANOTHER MISSED CALL I DECIDED NOT TO CALL BACK AS I WAS STILL ON SHOCK, AT ABOUT 10.AM THAT MORNING SHE CALLED AND I PICKED SHE SAID CAN WE SEE AFTER WORK TODAY I SAID YES SO SHE ENDED THE CALL IMMEDIATELY I GOT OFF WORK SHE CALLED ME AND TOLD ME WERE TO MEET HER, I WAS STILL ON SHOCK, BEHOLD WHEN I GOT THERE I SAW KATARINA CRYING WITH TEARS ALL OVER HER EYES, AND SHE SAID TO ME MY HUSBAND, I AM SO SORRY IMMEDIATELY I HUGED HER AND KISSED HER WHICH I HAVE MISSED ALL THIS YEARS. ALL THANK TO DR..USMAN KERIM. IF YOU ARE A MAN OF A WOMAN READY THIS AND YOU ARE PASSING THROUGH SIMILAR PROBLEMS LIKE MINE, DO NOT FAIL TO CONTACT THIS GREAT MAN DR.USMAN KERIM HE IS REALLY INDEED A REAL SPELL CASTER. (8) If you need help spiritually. NOW I DON’T WANNA TALK ABOUT MY LIFE BUT I HAVE FOLLOWED MOST OF THESE CRAPS AND GOT USED. MOST OF THESE PEOPLE TELLING YOU BEWARE THIS BEWARE THAT ARE BUNCH OF CRAPS AND SCAMS. I SEE MOST OF THEM COPYING AND EDITING MY TESTIMONY TO SCAM YOU BUT YOU HAVE TO BE DAMN SURE.. I WOULD HAVE BROUGHT HIM RIGHT HERE IN THE STATES IF POSSIBLE. AND MY MARRIAGE. I WANT TO LET YA ALL KNOW THAT YOU DON’T HAVE TO TRY ANYBODY ELSE EXCEPT THIS DUDE.